Five soldiers with a collective 120 years of experience have some words of wisdom for NCOs transitioning to civilian life. They appeared on a panel I moderated in New York City in June 2014 to give some tips about how to prepare for a post-Army life and get attention in a competitive job market. Their discussion comes at a time when transition is on the minds of many soldiers because of the drawdown that would trim the ranks by some 60,000 people over the next three years. If you are not going anywhere, there are people in your command who might be headed to civilian life who could use your sage advice. One thing often missing in a private business is someone comfortable with making decisions without waiting for approval of a supervisor, said Matt Pelak, an Iraq War veteran and director of strategic partnerships at Team Rubicon Inc., a nonprofit group that organizes veterans to respond to requests for disaster relief. Having this skill makes you highly marketable. As managers in an organization that thrives in uncertain and chaotic environments, Pelak emphasized that NCOs have the critical thinking skills and the ability to make level-headed decisions during operations without getting excited. “NCOs are a shining example. They take the information they have, they know their commander’s intent, and they make decisions; not always a perfect decision, but generally always a 70 percent to 80 percent solution at that time, allowing the organization to push forward versus waiting for [a] 100 percent solution and not making a decision and feeling the need to call the boss,” Pelak said. “If you hire an NCO, give them clear guidance, have them understand your intent and they will carry out their duties,” he said. An example is Command Sgt. Maj. Hector A. Prince, who was the top enlisted soldier at Fort Hamilton, N.Y., until he relinquished his post last July. “I’ve been planning for retirement for nine years,” he said. Prince advocated having both short- and long-term objectives in preparing for transition and taking advantage of all of the free advice the Army makes available. “You have marketable skills, whether you spent three years [in the Army] or more,” said Juan Caez, the director for plans, training, mobilization and security at Fort Hamilton. Resume writing is one of those things that should start early, Martinez said. It helps to understand the value of skills as they are learned and also creates a cadre of NCOs who can teach their soldiers to write resumes. “We want you to teach your soldiers how to write resumes so they will be better prepared,” he said. In addition to mentorship, it helps to network, Robinson said. “When we hear of networking, we think of brown-nosing and looking for handouts. I thought that way too for a long time, until I met a professor who teaches [that] the value of your network will determine your income. I never looked for a job. I looked for opportunities. I looked for big problems to solve,” Robinson said. Networking isn’t a stretch for NCOs, Martinez said. “We have been networking our entire life, knowing who to contact when you need a resource,” he said. The key is finding people who are the right resources for getting ahead after leaving the military. Pelak suggested that soldiers attend professional events and workshops where people can learn about their work ethic and competence. “The solution is not going to come to you looking at a computer screen sitting at home on Facebook,” he said. One way to do that is to take advantage of every opportunity for credentialing, licensing and apprenticeship programs that provide evidence that a skill learned in the Army has value outside the military. “Credentialing and certification is the key in gaining this civilian recognition for the skills we gained in the Army,” Robinson said. 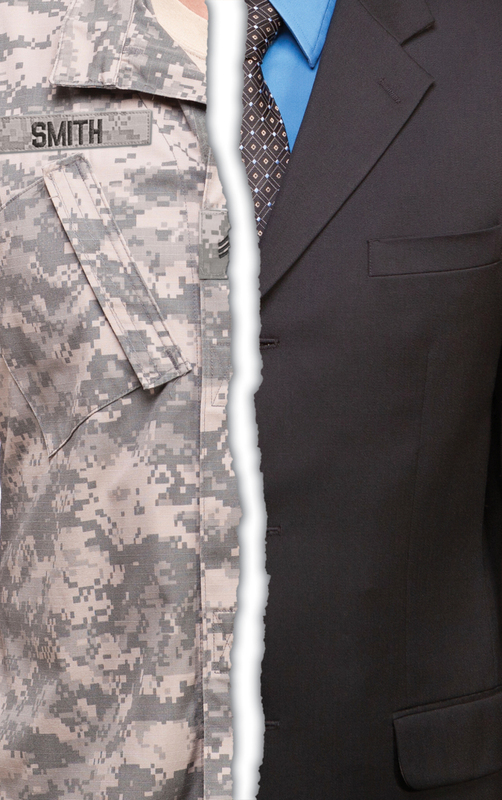 As your separation or retirement date nears, Martinez suggested taking a good look at post-service programs that enable you to get a head start while still in uniform. “Look into apprenticeships and educational opportunities early, so if you have an interest, you can start the application and approval process,” he said. When writing a resume or interviewing for a job, focus on the experience and skill you bring to the job, Pelak said. “No one cares how many parachute jumps you have, or are you really good at entering and clearing buildings,” he said. Identifying where you want to live is a major step in transition, Martinez said, and that involves more than just picking a garden spot. About one-third of soldiers remain close to their final duty station, one-third return to their family home, and one-third look for the location where they can make the most money, he said. Finding the money takes research, Martinez said. “If you want to go to Pittsburgh, ask what is the unemployment rate, what is the economy like, what jobs are available,” he said. He suggested answers to those questions are available from the Bureau of Labor Statistics, which provides economic and occupational outlooks. There is no use fooling yourself about your abilities. You should know your strengths and weaknesses, including your occupational skills and leadership qualities, Pelak said.